In a hurry to contact California co-sponsors to say #HandsOffTheADA? DREDF has contact info and scripts. 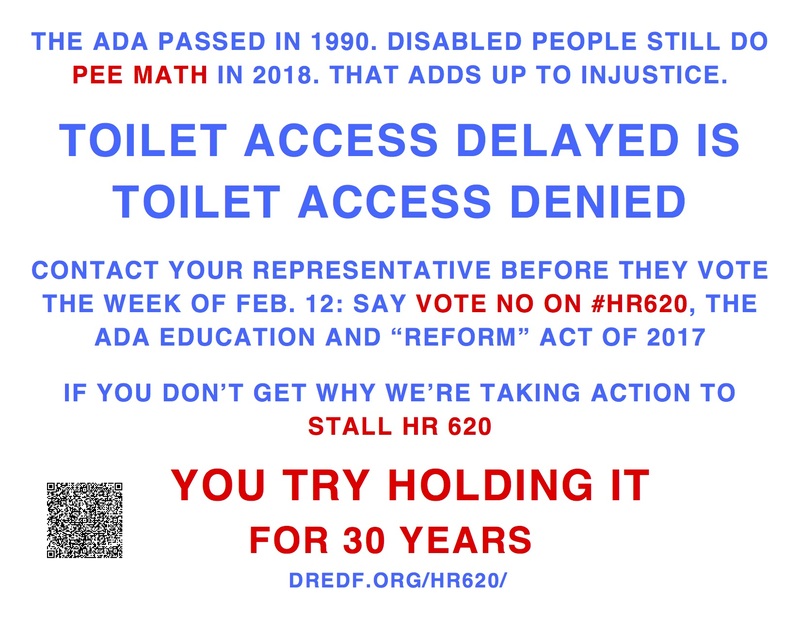 It is profoundly demoralizing that Rep. Speier and other California members of Congress are cosponsoring #HR620. Imagine that you have a harasser. Imagine that never know whether he will block you from getting into the public bathroom you need — sometimes pretty badly! — or not. Imagine hearing that your harasser deserves 6 months to make “reasonable progress” toward not-harassing you — as much. After you wait 6 months, maybe you’ll be allowed to say NO to your harasser. Maybe. Access to a toilet is about dignity and safety whether the barrier is a harasser or a narrow door. In my particular line of work — fundraising — I have the “challenge” of making the case for funding cross-disability civil rights work from institutional funders who are still predominately stuck in the disability = tragedy trope. I need allies from outside the cross-disability communities because that’s how philanthropy — and everything else — works: it’s who you have relationships with, who you can ask for help, give help to. Disability human and civil rights violations. Way too many of them. Violence against disabled children and adults – especially people of color (PoC) with invisible disabilities — even by caregivers, school personnel, and law enforcement officers, and that such violence at home, in school, and on the street is excused or rationalized. Girls who have internalized stigma that makes it feel “normal” to disown, downplay, or deny having a disability. Girls who hear – even from some disabled people – that “initiative” and “personal responsibility” can defeat systemic barriers born of — and well-maintained by — prejudice, and that they’ve failed if they’re defeated by rigged systems. In 2017, an inclusive movement includes cross-disability civil rights organizations, as a given.